The official opening of the Barlow in Sebastopol was just about two years ago. We have visited The Barlow several times since, but not until last week could we simply state, “The Barlow has arrived!” This time the Barlow was a bevy of activity, with each of the artisan purveyors having enough customers and clients to keep them busy and thriving. There are still some empty storefronts, but those promise to be in operation soon. So what exactly is The Barlow? For those old timers, Sebastopol was once the area of many apple orchards. During the apple picking season, one could smell apples in the air along the drive on Highway 116 through Sebastopol. But then along came the vineyards, slowly displacing the apple orchards. The apple processing center closed, and then came The Barlow on McKinley St. The Barlow is a 12.5 acre site of industrial-style complexes. It is a wine, food and art mecca. On our visit last week, we walked past all the shops. Our lunch stop was the Zazu Kitchen and Farm. Next, the Wind Gap winery for some very nice, crisp Chenin Blanc. Besides the Wine Gap, The Barlow also has the MacPhail, Miramar and La Follette tasting rooms. On a previous visit I’d interviewed one of the great winemakers of the world, Greg La Follette. If you like beer, be sure to visit the Woodfour Brewing Company. And finally, not to be missed, is the Community Market. Its motto is, “Food for people, not for profit.” There are many other interesting shops and more to come, including the Hotel Barlow. The Hotel Barlow will be completed in 2016 with 60 rooms, a restaurant and a fitness center. 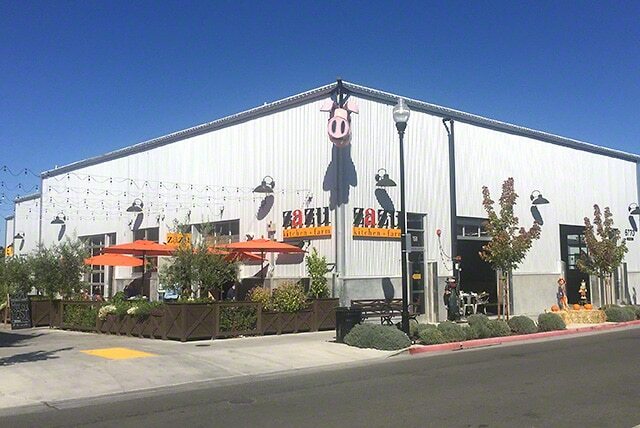 To get to The Barlow, from Highway 101 in Santa Rosa, take Highway 12 to the West. Turn right at Morris Street and then left at McKinley.